I hadn't heard about it before. A couple of days earlier I had just attended Openhand's level 1 in Malmö, and I felt a lot of similar messages being conveyed. They even breiefly mentioned five gateways. It's about realigning with your soul. Groups gather around the world, sit together, meditating by focusing on the space between the eyebrows (not third eye) channeling/transmitting energy from Masters of Wisdom, to help heal the world. It seemed like such a "coincidence" that I happened to hear this lecture after meeting Open and Trinity. At the same time, the people telling about it didn't touch my heart... And I don't know what to think about the fact that you should focus on this place between your eyebrows. A few lines about spreading love and light should also be read out loud in the group before starting to meditate. That made the group very "stiff" and I felt a lot of people were uncomfortable with that. Perhaps it was just the facilitators and that specific event. The idea of saying your hearts purpose out loud doesn't feel wrong in itself. I was intrigued but didn't feel "YES!". Have you heard of Transmission meditation? What is your stand on it? Yes I've heard about it. I believe the idea is to transmit energy from higher dimensions into this realm, which is essentially what both Trinity and myself do. A couple of very important points though: to do this effectively, requires the person to have traveled far and cleared much. Otherwise it's likely to result in tightness and efforting - perhaps that's what you were referring to Charlotte? The other risk is to cause one to go out of body to a degree, which can result in all manner of spurious energy interventions through especially the 4th Density. So for me, to make it fully pure and effective, is to penetrate through the lower densities to make sure they're clear. Then you start to find you open automatically into the higher ones. 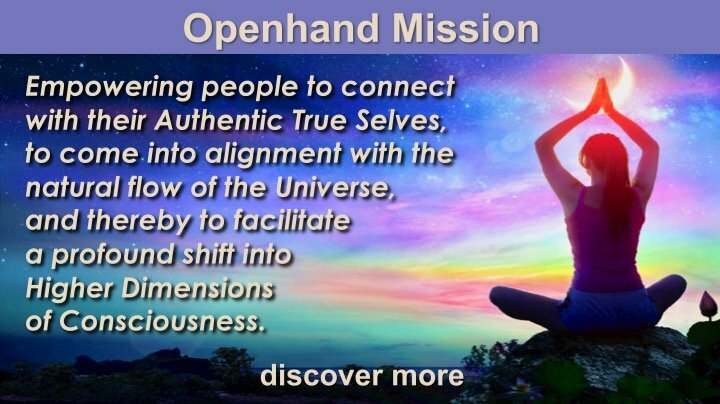 That's why in the Openhand meditations, we're keen to get people connecting through their bodymind and clearing those fields first. It's also why we're working to act as a bridge with people through those experiences and into the higher realm of consciousness. My experience is you can't rush these interdimensional experiences. The best advice I would give is to begin where you are. Keep working with what you feel now. Keep figuring out exactly what is real and authentic for you, then how is that experience wanting to evolve naturally by itself? Thank you so much for your reply, Open. I appreciate it very much - and I agree with you, that it is wisest to begin where you are. I had just never heard of "five gateways" until Martin told me about you and Openhand, and straight after your level 1 in Malmö, I stumble upon this where they mention five gateways (and emotional level, like you spoke about). I was volunteering; helping out putting chairs out for the event, serving water etc, and I didn't really know what the lecture would be about. There was one woman who attended who was clearly not well or in balance. She was talking to herself the whole time and spoke nonsense. Some of the other attendees laughed at her behind her back. So they who did that were not in balance either. And I guess, when you are not, it is not an effective transmission - or can even harm you? I had a belief that if your intention is right, however, the angels will help, and that anyone then can transmit healing energy (more or less effectively). The tightness I felt in the group, was that people were awkward reading out loud lines on a piece of paper. It felt like going to church when you were a child. Although the lines were very beautiful. Thank you again, I do agree and really like the idea of not "trying" but rather let experience evolve naturally.